Buy the ZeverSolar Zeverlution 2000S inverter at the lowest price – online only. The strength of this inverter lies in its great voltage range. It starts at 80 V which allows you to start producing very early in the morning and continue until late at night (eg. when the sun is low). It isn't equipped with a transformer to offer a maximum output of up to 97%, one of the best in its category. PhotonTest, an independent organisation which tests all the inverters available on the market, has listed this inverter in its Top 10 after testing more than 150 models. The company SMA, the market leader in solar inverters, acquired the company ZerverSolar in 2013. The Zeverlution 2000S inverter is one of the least expensive inverters available on the market. Output raised to 97%: The ZeverSolar 2000S inverter has one of the best outputs of its range, particularly in partial shading. Thanks to its large voltage range, it produces electricity in an optimal manner from early in the morning until late at night. WIFI connection: This inverter comes with an integrated WiFi Internet connection using the Combox. Connect it to Internet and benefit from free online supervision. Connect your mobile directly to ZeverCom. Lightweight: The Zeverlution 2000S is not equipped with a transformer and has the advantage of being light-weight. Connecting it to your photovoltaic panels is very easy. Quick start: The Zeverlution 2000S by ZeverSolar starts quickly. Using the lowest start-up voltage available on the market, the ZeverSolar inverters produce energy from the first rays of sunlight. Your production gain totals almost 5%. 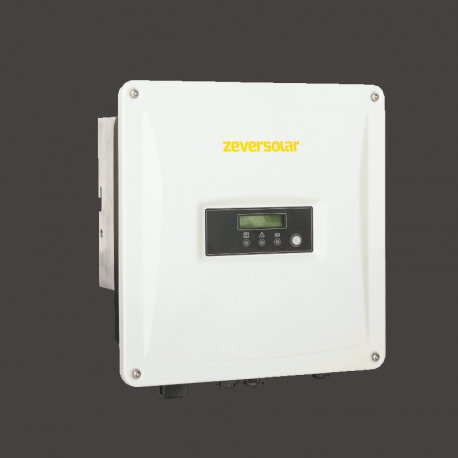 Single-phased inverter: The ZeverSolar Zeverlution 2000S is a single phase inverter.